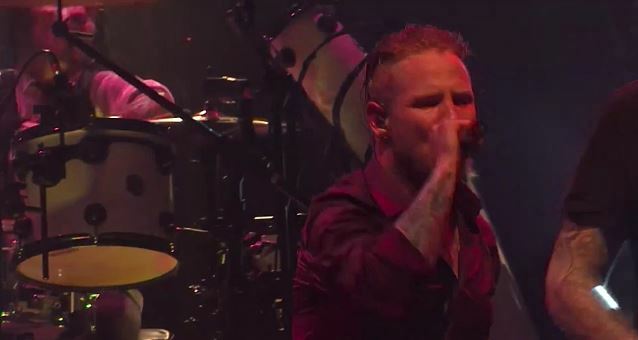 The official video for STONE SOUR's cover version of the METAL CHURCH song "The Dark" can be seen below. The track, which was laid down live at Room 237 in Burbank, California in March 2014, was recorded specifically for the film "Fear Clinic", the new horror flick which marks SLIPKNOT and STONE SOUR frontman Corey Taylor's first featured role in a film. The song — the original version of which, appeared on METAL CHURCH's second album, 1986's "The Dark" — was chosen for "Fear Clinic" by director Rob Hall and Corey as they felt that the lyrics fit well with the story. "Fear Clinic" will be released on Blu-ray and DVD on February 10 by Anchor Bay Entertainment. The highly anticipated shocker also stars horror icon Robert “Freddy Krueger” Englund, Fiona Dourif, Angelina Armani and Thomas Dekker. It is directed by Robert G. Hall ("Lightning Bug", "Laid To Rest", "ChromeSkull: Laid To Rest II"). As previously reported, STONE SOUR has set "Meanwhile In Burbank" as the title of its upcoming covers album, which is tentatively due out before the end of the year. The group recorded some of the set at a Burbank, California studio owned by STONE SOUR drummer Roy Mayorga. There's no word yet on which songs the band intends to include on the disc, which STONE SOUR has had in the planning stages for years. Taylor said on "The Jasta Show" podcast about the record, "This is something that we've been talking about since the first album came out, with STONE SOUR. We've always wanted to do this. Even as people have come, people have gone, this is still something we've always come back to, and we just never had the opportunity to do it. And we just kind of said, 'Well, screw it.'" Taylor added, "You're going back to these songs that you just love to listen to, not only just sing. And that's why it's called 'Meanwhile In Burbank', because, without giving too much away, that's where Roy lives — he lives in the Valley — so that's why we call it that. Because it's, like, that's what we're doing right now."